A penetration test is done to evaluate the security of a computer system or network by simulating an attack by a malicious user / hacker. 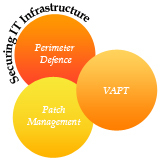 The process involves active exploitation of security vulnerabilities that may be present due to poor or improper system configuration, known and / or unknown hardware or software flaws, or operational weaknesses in process or design. This analysis is carried out from the position of a potential attacker, to determine feasibility of an attack and the resulting business impact of a successful exploit. Usually this is presented with recommendations for mitigation or a technical solution. This workshop gives an in-depth perspective of penetration testing approach and methodology that covers all modern infrastructure, operating systems and application environments. This workshop is designed to teach security professionals the tools and techniques required to perform comprehensive information security assessment. Participants will learn how to design, secure and test networks to protect their organization from the threats hackers and crackers pose. This workshop will help participants to effectively identify and mitigate risks to the security of their organization’s infrastructure. This 40 hour highly interactive workshop will help participants have hands on understanding and experience in Security Assessment. A proper understanding of Security Assessment is an important requirement to analyze the integrity of the IT infrastructure. Expertise in security assessment is an absolute requirement for a career in information security management and could be followed by management level certifications like CISA, CISSP, CISM, CRISC and ISO 27001. Therefore this workshop will prepare you to handle VA / PT assignments and give you a better understanding of various security concepts and practices that will be of valuable use to you and your organization. This workshop will significantly benefit professionals responsible for security assessment of the network / IT infrastructure. Anyone aspiring for a career in Security Assessment would benefit from this workshop. The workshop is restricted to participants who have knowledge of ethical hacking & countermeasures. The entire workshop is a combination of theory and hands-on sessions conducted in a dedicated ethical hacking lab environment.